Well, its been a year since I last wrote a post, funny how life can get in the way. That, and finally having time and a topic that I was passionate enough to write about! What brings me back to the blog world? None other than the dreaded task of packing lunches! The past few years I’ve been blessed with an amazing sitter who provided lunches to my daughters when they were in her care a few days a week. That only left two days I needed to pack a lunch for my older daughter to take with her to preschool. Well, those days are over and now I have a soon-to-be kindergartner! I can barely wrap my head around the idea that my first born is beginning her formal schooling. Where has the past 5 years gone?? My youngest will also be in preschool four days a week, and needing lunches too. Time to get organized, and be prepared! Its one thing to physically pack a lunch and an entirely different monster to figure out what that lunch will be – provided you have all the ingredients in the house! I’ve seen many wonderful lunch box ideas on Facebook, Pinterest, mommy blogs, etc. Although I need a blueprint I can turn to each week to help me grocery shop, outline a consistent, weekly meal plan, and offer varieties so it doesn’t get too boring for my girls when they eat their noon time meal. I’m sure this idea exists out there, but I wanted to personalize a menu that would work for our vegetarian diet, be healthy, and something that didn’t take more than 15 minutes to pack up. I love all the amazing lunch/breakfast muffins, casseroles, roll ups, etc that I have seen on some creative blogs; but I also wanted to be honest with myself and face the fact that I would not be able to achieve such culinary treasures on a regular basis. I want simple but healthy, and every now and then I’ll try a fun, new, more labor intensive meal; however on a regular basis, time is of the essence. 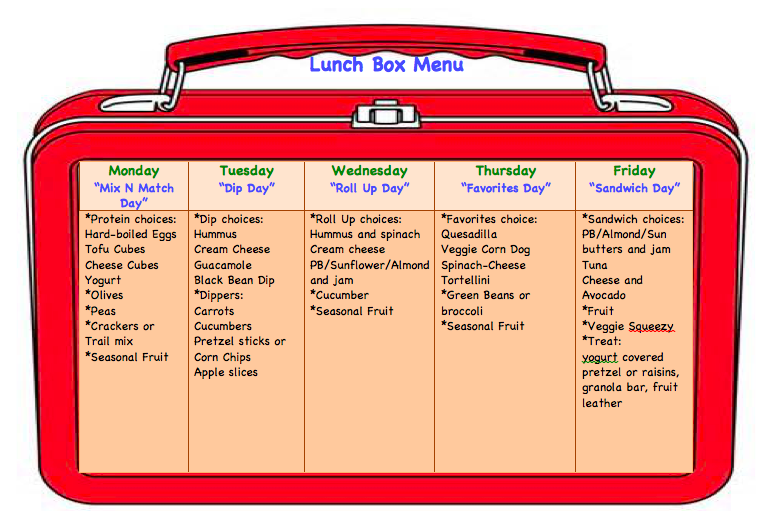 Enter The Lunch Box Menu! So I sat down and drew up some ideas, enlisted my Instagram followers for help, and today I typed up a menu. Every Monday will be the same type of meal, every Tuesday will be “Dip Day” and so on…but the girls will get to choose their protein or dip or roll up each week. So yes, every Friday they will have a sandwich, but that will vary from week to week. After I created the menu I put it in a sheet protector, and I will have the girls sit down each weekend and use a wipe-off marker to select their choices ahead of time. I might even have them help me pack their lunches on some evenings too. Of course if we have leftovers from the night before I might pack those instead, or allow my oldest to buy school lunch on occasion, but most days I am hoping this might help my tired, night-time brain, and make packing school lunches just a little bit more fun! I’d still love other suggestions, as I am sure I will revise it as the months go on, and add more ideas. So feel free to leave a comment with your input too! The only requirement is that it should be simple (think less than 5 ingredients), not need to be heated up at school, and require no more than 15 minutes to put together. I know there are awesome make-ahead freezer ideas out there too, and I will probably do some of that to supplement too, but I don’t want to rely on always having something in the freezer. Click on the hyper text next to the picture above, and feel free to take the menu and tweak it for your own family. There are so many ideas out there, and without the vegetarian limitation, I’m sure you can add even more yummy lunches. Or for those who might be gluten-free (and maybe once my kids like salad!) one could add in lettuce wraps and other healthy options. 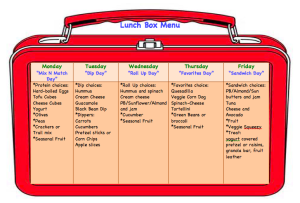 This entry was posted in Being prepared, Food, Staying organized and tagged lunchbox meals, lunchtime, meal planning, menu. Bookmark the permalink.